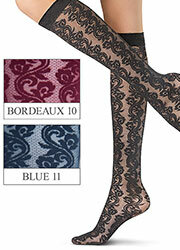 A design like this screams "Oroblu" to us and any legwear fan. It is an Italian design through and through, with flourishes, florals and fantastic levels of detail. The richness of this simple design is admirable, but it's also the way it is elegant and controlled that really makes it a versatile number.